01.03.2019 19:00 - Daily updated recap of the Eurolanche Invasion X with a photo of the day and important links. 12.02.2019 10:00 - Links to all articles about Eurolanche’s eleventh trip to the US. 11.02.2019 18:00 - A commentary to the eleventh Eurolanche Invasion. 11.02.2019 16:00 - Twelve Eurolanche members will participate at the eleventh Fan Club trip. 10.02.2019 10:00 - Don’t miss anything from Eurolanche’s eleventh trip to the US. 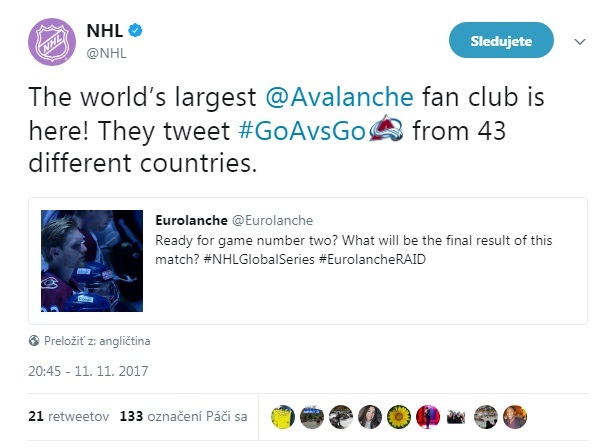 09.02.2019 20:00 - Robert Heppekausen was one of two first Avalanche fans from Germany who traveled to Denver with the Eurolanche. He looked back at this experience at the Eurolanche Invasion VIII in the following recap. 09.02.2019 18:00 - A manual on how to meet Invasion XI participants in the US. 09.02.2019 10:00 - Follow the eleventh fan club trip via live videos.